Check your text messages from Shoppers Drug Mart today! I got a BOGO Nail Polish offer! 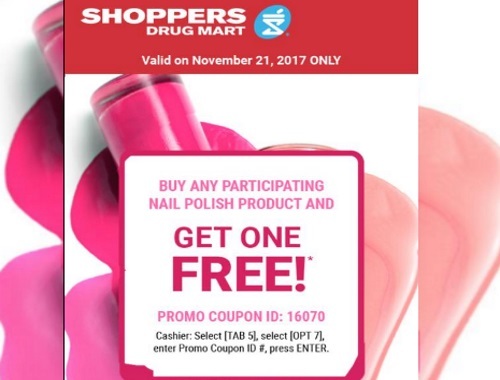 When you buy any participating nail polish product you can get 1 Free! Offer is valid November 21, 2017 only and valid IF you have the coupon. Did you get this offer too? Let us know on our Facebook Page. Click here to browse the Shoppers e-flyer.